I have a book filled with doodles and sketches, some I share with you and some are inspiration for me to keep sketching to improve… definitely not share worthy. I have done a few “art journal” pages, but nothing close to some of the fantastic art journals I’ve seen on some artists’ blogs and sites. For example, yesterday it was raining.. actually raining! After the long, hot drought we’ve had, I was giddy and started doodling away, writing nursery rhymes, then pasted in one of my precolored digital stamps and a vintage graphic from The Graphics Fairy. This was not made to be seen here. It was made solely for me, in my happy, rainy day silliness, but I wanted to show you why I believe I need art journaling classes. 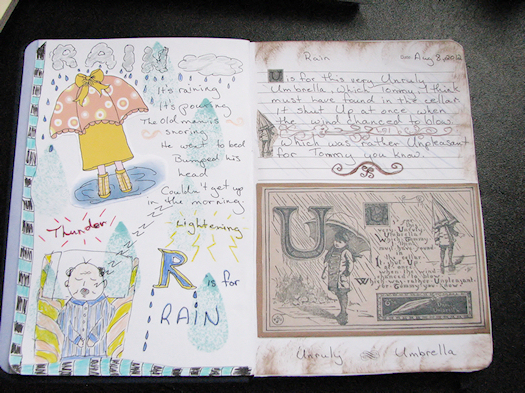 Rainy Day Sketch/Art Journal Pages Tori B. The fun I had making the pages above, made my decision to take Jenny and Aaron of Everyday is A Holiday’s Art Journaling Classes an easy one to make. I am ready to do some art journaling. I want to do something different. I want to practice painting. I want to experiment with mixed media. And, art journaling just looks so darn cool. Today was Class One. 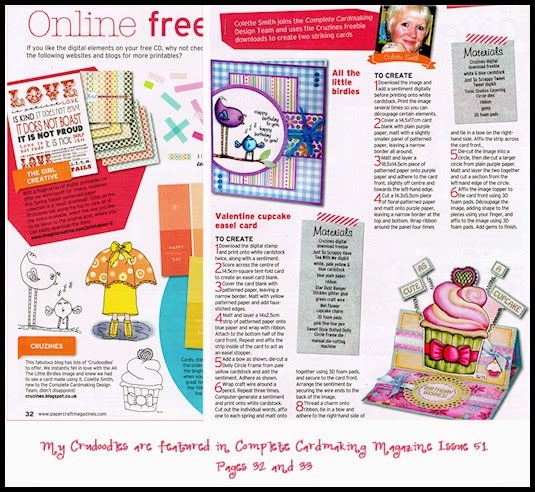 Jenny and Aaron took us step by step through the steps they took to create the fabulous pages they made for today. Then challenged us to do our “homework” and create an art journal page. I had no ideas… none. So I pulled out some scrapbook paper and started going through it. 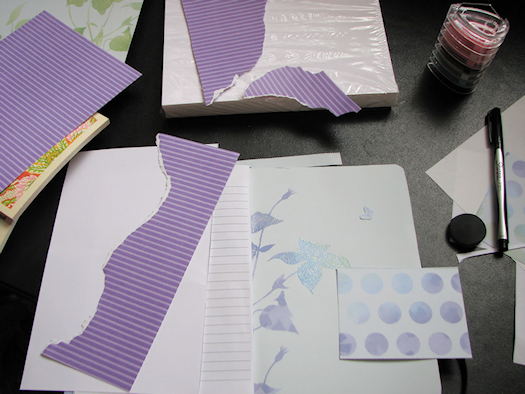 For some reason, I was loving the purple striped paper, so that’s where I started. I found two other pretty papers that I thought I could use with the stripes. 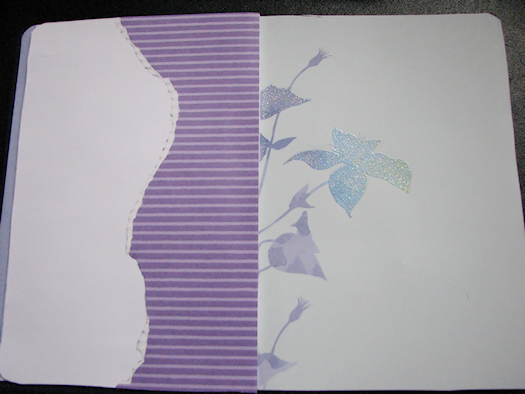 Step 1 – Tear and cut the papers to fit and glue to the pages. 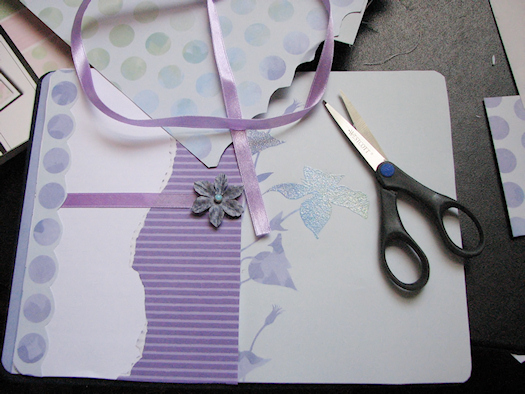 Step 2 – I cut a scallopy border from the dotted paper and glued it down, added ribbon and a fabric flower. 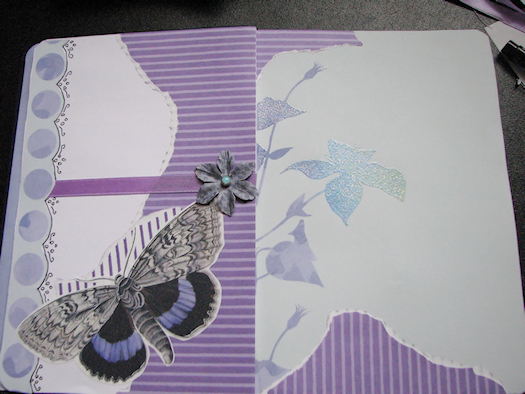 Step 3 – I added purple stripes to the right page, then outlined the scallop and did a little doodling around it. The flip side of the purple striped paper is white with dark purple stripes, so I used a small piece of it under a vintage picture of a moth, (found at The Graphics Fairy). Step 4 – Didn’t like that I had the stripes going vertically on the bottom of the right page, so I ripped it off and redid it. I added another vintage grapic that I had found at The Graphics Fairy, a lady in a hat. Once I placed her, I finally knew where I was going with these pages. The lady in the hat was one of three that were on a vintage Millinery advertisement. I added the other two ladies. I traced around the printed flowers with my Sharpie pen and added a few details. Using pigment inks and watercolors, I washed and stamped over edges and in the blank areas. I added a word cutout and another piece of white with purple paper, wrote some text with my Sharpie pen, doodled a few small ornamental doodles and added some dots of turquoise paint to the bottom right. 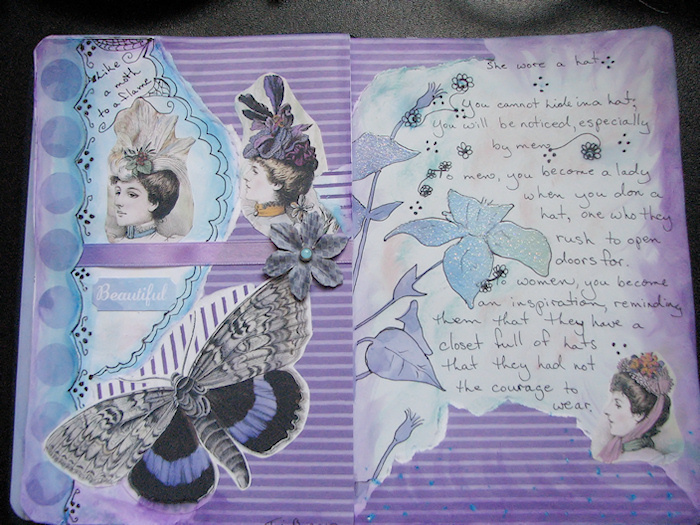 I made the photo of the final version a little larger than the others and the full size won’t fit here, so please click on the picture of the finished journal pages to read and see the details. I’m really happy with this, especially as I had no idea what I would make when I first started. This first class was a blast. I can’t wait to see what Class Two will bring. 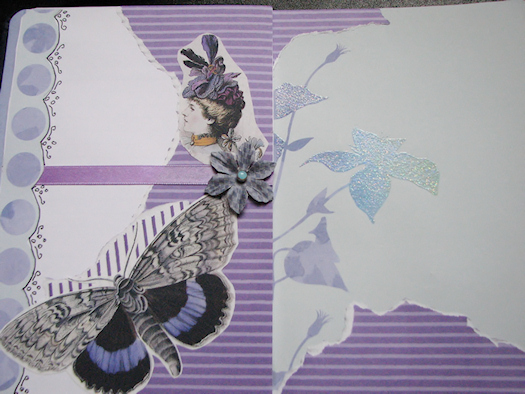 Posted in Uncategorized and tagged altered art, art, art journal, crafts, paper crafts, vintage. your pages came out absolutely beautiful! I love the vintage graphics, so lady like. I'm excited for next week and to see what everyone comes up with. Oh my gosh, this is so pretty, Tori!! Loving the color scheme, placement, everything. I hope you continue Jenny & Aaron's classes/link-up. Can't wait to see your future art journaling work! this is so pretty! i love the use of purple!